Ready for some football? Treat your Super Bowl Sunday guests to more than just salsa and hot wings. By whipping up some football fun cupcakes, your guests can cheer on their team and have a sweet Sunday too. 2. 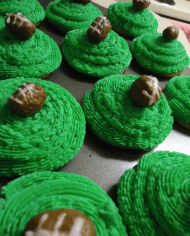 Place a chocolate-covered almond on top, then use white icing to create football laces. 3. Enjoy & cheer for your team!